The ASRL Committee has released Newsletter #66 which should already be in your Inbox if you have subscribed. 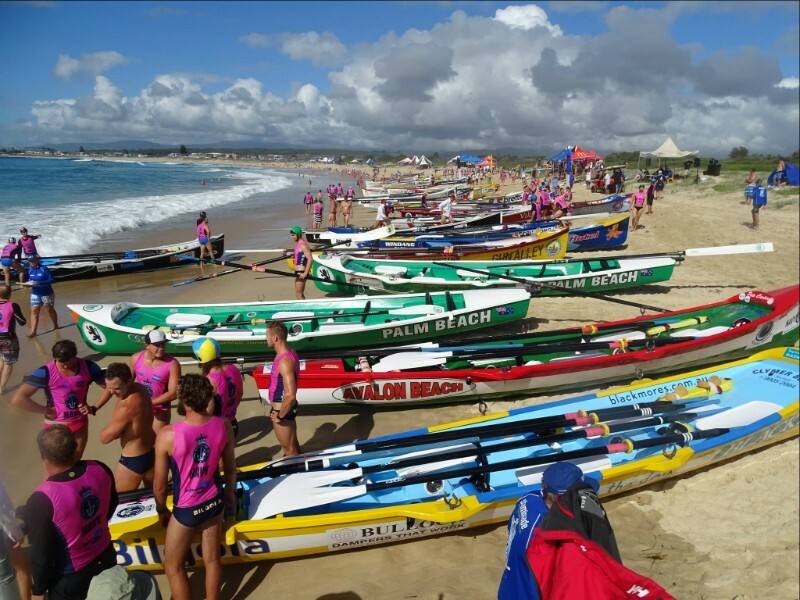 The Newsletter contains important information regarding Changes to the SLSA Surf Sports Manual, New Female Racing Divisions and more. All rowers are encouraged to have a good read. Newsletter #66 is below. The ASRL has been involved in several important changes to the SSM that will beneficially affect all rowers from this season forward. SLSA has a responsibility to continually review and update its policies to reflect member requirements. To this end SLSA has reviewed its Masters Competition Policy 5.09 to achieve age and gender equity and to demonstrate continuous sport improvement and to encourage participation. Along with an update to Competitive Rights & Transfers Policy 6.24 to allow two (2) transfers per calendar year.  Gender equity and age equity for all masters individual events.  Gender equity and age equity for all masters team events i.e. there will be separate male and female team events and no mixed team events (except for the SERC).  Flexibility be considered should there be program issues at events conducted by SLSA, States, Branches and Clubs.  A streamlined approach to the conduct of events in competitions and for future review of events to be conducted. All Masters events listed in the new Policy were conducted at the 2016 SLSA Pool Rescue Championships and the Ocean events will be conducted at the 2017 SLSA Masters Surf Life Saving Championships. 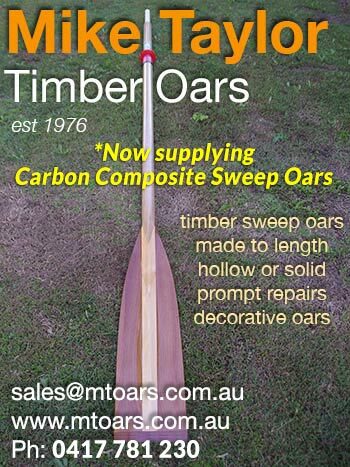 The third issue is Composite Crews and we touched on that in Newsletter 65 with reference to the relevant Section 12 of the SSM. Further to that we sought clarification from SLSA as to how the policy was to be managed at Championship events and a joint statement on this issue can be found HERE. Basically composite crews may be allowed by the rules of local competition for day to day events but composite crews will not be eligible to compete at Championship events. We will again be conducting selection events for the two senior Test Crews and two Youth Development crews to travel to New Zealand for the test series this coming season. It is important to note that the senior team is a fully funded Australian Team but the Youth Development in accord with SLSA policy will be a self-funded Team and nominating crews need to consider this. 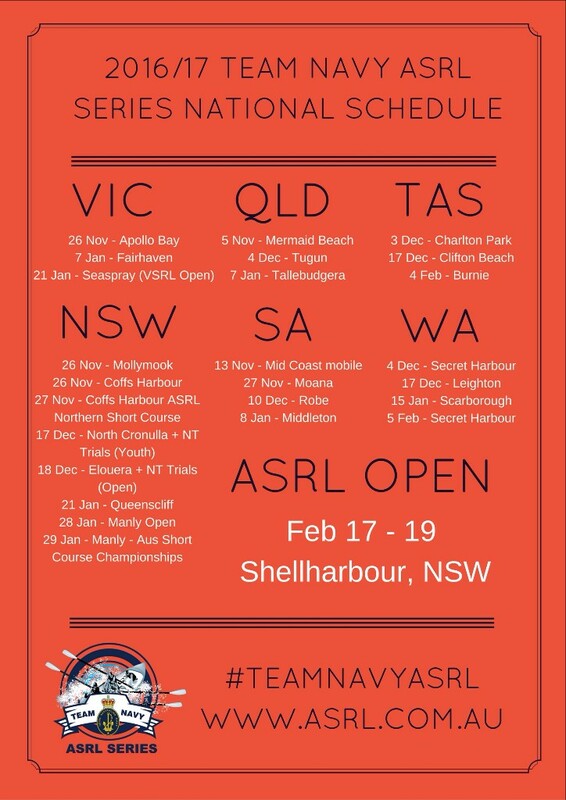 This season membership will include entry into the ASRL Open event at Shellharbour and has been set at $40 per head. 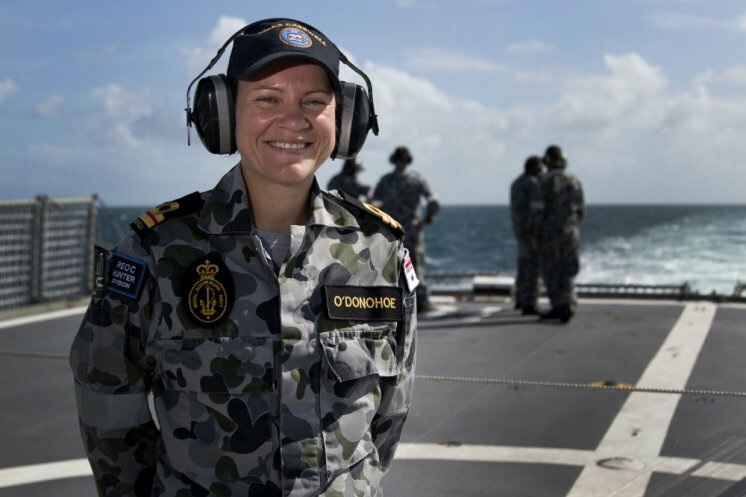 Adelaide intensive care nurse and Navy Reserve Nursing Officer, Delaney O’Donahoe, recently escaped the cool southern weather to finalise her officer training onboard helicopter frigate, HMAS Anzac. The trip which started in Darwin and finished in Sydney via Eden, involved Lieutenant O'Donahoe consolidate her initial training at the Royal Australian Naval College at HMAS Creswell on the New South Wales south coast and experience life at sea. Navy Nurses serve both full time and in the Reserve as members of multi-disciplinary teams responsible for the good health of Navy personnel. Workplaces vary from well-equipped hospitals ashore to clinics on ships and facilities under canvas when deployed in international teams on operations. Reserve nurses often deploy at short notice from their civilian roles as part of Australian Defence Force support to humanitarian assistance and disaster relief missions. Lieutenant O'Donahoe had previously completed leadership and management modules, drill training, the Navy swimming and fitness tests, a pistol course and security awareness training at Creswell. She was then required to complete another eight modules via distance learning on topics such as how to write in a Defence style, basic warfare, naval history, the Defence Force Discipline Act and Maritime Doctrine. These units are self-paced over 12 months to allow for members to combine service with civilian work requirements. 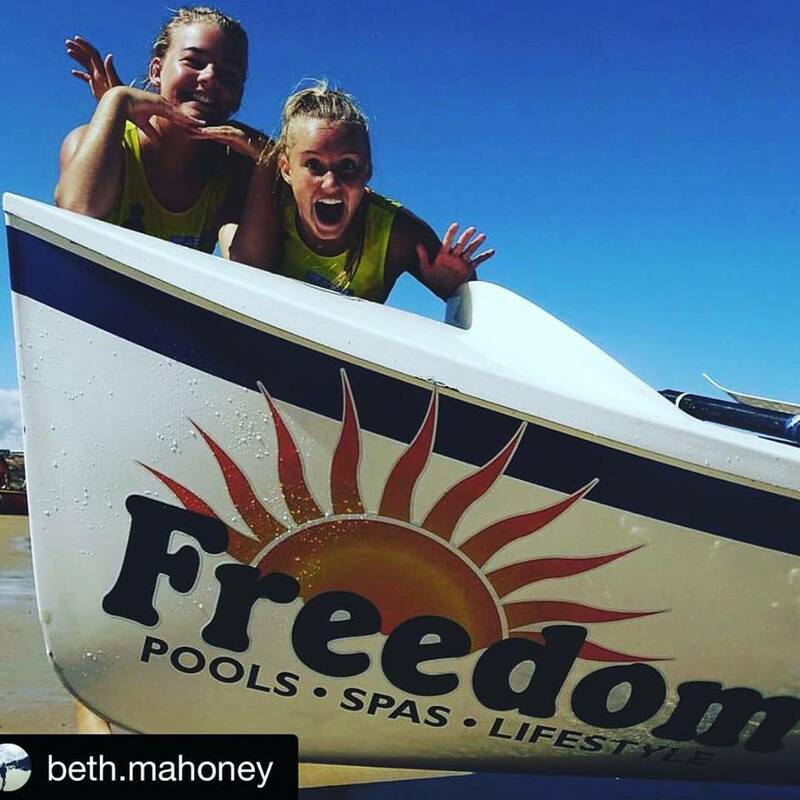 Lieutenant O’Donahoe had some previous 'sea time' as a competitive surfboat rower with Brighton Surf Life Saving Club in the Navy sponsored Australian Surf Rowing League. 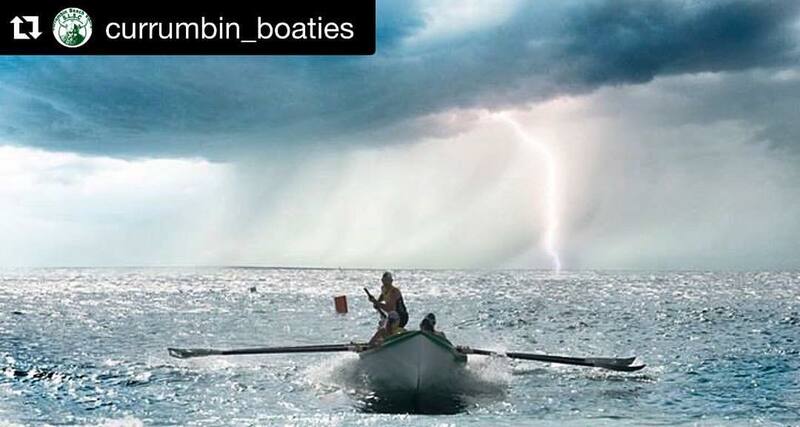 "That surf boat weighs around 250 kg, and onboard a 3,800 tonne Anzac frigate the differences were obvious but the crew were really welcoming and it is pretty clear that small teams working together can achieve big things in both environments,” Lieutenant O’Donahoe said. Before she proceeded to sea she was also trained in basic survival at sea, along with leak and damage repair techniches, basic first aid (although she was well across that one!). "Along the way I had the opportunity to ride in the Rigid Hull Inflatable Boats that are used for boarding parties when we were off Cape York, did physical training on the flight deck at sunrise and observed small arms training up close," she said. The aim of the sea training deployment, which usually takes about three weeks, is to familiarise Reserve members with all the parts of a working ship, to enable their specialist skills to be readily employed in the future. That said, for an intensive care nurse, away from the bustle of a working hospital, the voyage was also a chance to reflect on the simple things in life. "Watching sunsets out on the ship’s flight deck seeing nothing but sky, sea and stars was the most amazing part," she said. Lieutenant O'Donahoe will be applying her intensive care skills across a range of defence operational environments across the world in the near future. If you'd like to join her visit https://www.defencejobs.gov.au/navy/jobs/NursingOfficer/.